While shopping for a new toaster, you’re likely guided by just a few key criteria: price, quality, and number of slots. There are endless toaster options on the market, so we took on the task of searching for a handful of the best to help you narrow your search. What you’ll notice once you dive into toaster research is that it is very difficult to find a consensus among experts and consumers about “the best.” This is due to individual preference, of course, but it also speaks to the nature of toasters in general. They can be touchy when trying to control browning, for instance, and there isn’t a standard size that accommodates larger items such as bagels. Additionally, it can be tough to find any one toaster that browns at your selected level consistently. And finally, short warranties and durability issues frustrate some shoppers. With all that in mind, our selection accounts for price, reliability, consistency in toasting, and additional service factors such as warranty and customer support. We also researched consumer reports and read through customer reviews on Amazon and elsewhere. So, let’s dive in! Cuisinart claims our pick as best overall for a few reasons, namely price, size, and consistency. Both versions are highly affordable (coming in at well under $50) and this particular model of Cuisinart appears on many other ‘best’ lists (even if it’s not always considered best overall). 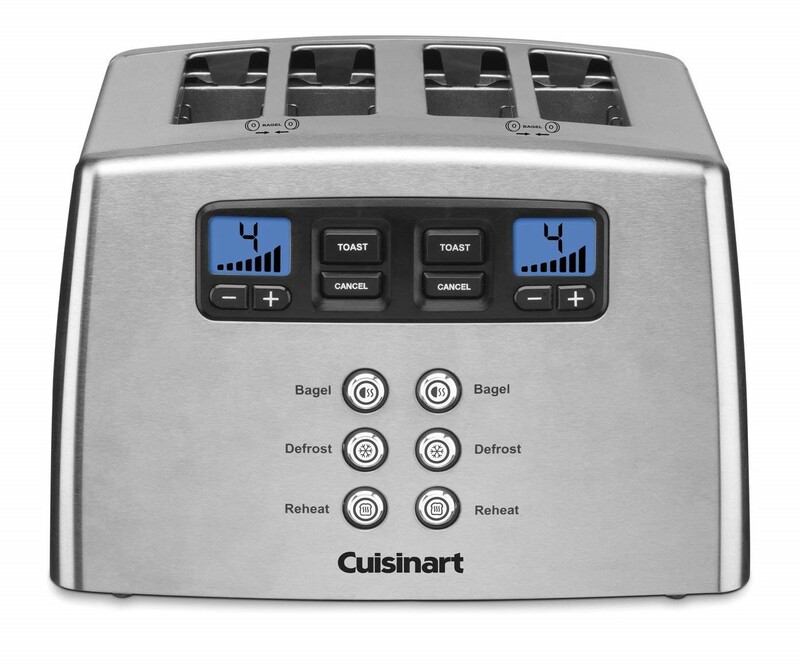 In addition to regular browning options (ranging from 1-7), the Cuisinart has Bagel, Defrost, Reheat, and Cancel buttons, making it a versatile device. Wide slots will accommodate bagels fairly well. Another key selling point is the included 3-year warranty, an anomaly among toaster manufacturers (most are just 1-year). The crumb trays are easy to access and clean. Reviews across the board are solid, with 4 stars being the average regardless of the seller (we read through other buyer reviews from Home Depot, Best Buy, and elsewhere), so overall customers seem mostly happy with the toaster. Regarding reviews, one significant thing to note (that you will likely notice straight away if you head to the Amazon product page) is that there are a few scary reviews from customers who claim the toaster caused a fire. We were only able to find info on this through Amazon reviews, so it’s quite possible these were just a few bad devices from a small batch sold through that site, but it’s still worth keeping in mind. Otherwise, the most common complaints are regarding inconsistent/uneven toasting, which you’ll see in most toasters, particularly the less expensive ones. Bottom line? The Cuisinart offers the best value and offers a small footprint, so it’s perfect if you’re on a budget or working with limited space. We don’t have any others under $50 that we’re head over heels for, but there are a few that you might be interested in considering. Here are some under-$50 toasters with fairly good reviews and which are widely available (i.e., not unknown brands only sold on Amazon). KRUPS Breakfast Set: This one is mostly well-liked by consumers and some experts, though Wirecutter had issues with it in their testing. Still, it’s a good brand and comes in at under $40, so it’s worth adding to the list of potential candidates. Hamilton Beach 2-Slice: If you are an infrequent toast-maker who wants to spend under $20, Hamilton Beach is probably your best bet. It does get hot to the touch and isn’t going to last forever, but it’s cheap, and it toasts bread. Toasters tend to fall into two price ranges: under $50 and over $100. There isn’t much worth talking about in the $50-$100 price range, but here are a couple options that might appeal to you. 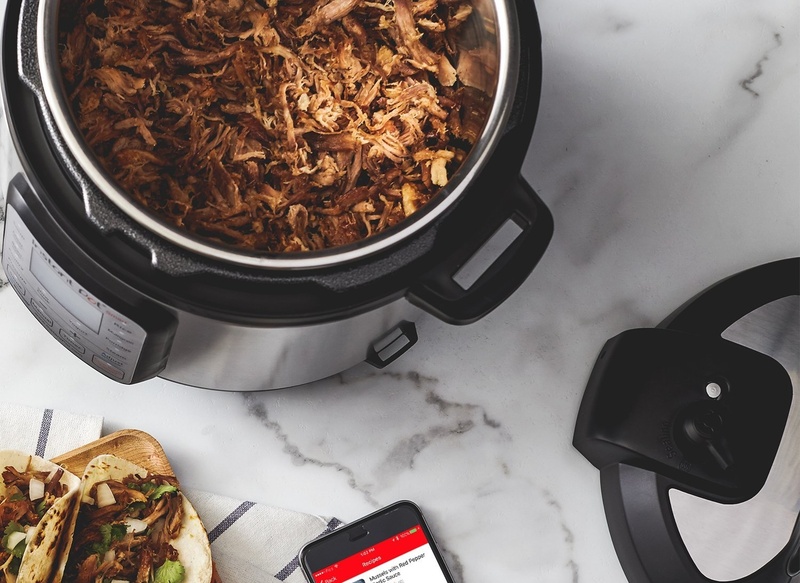 A clever digital interface, leverless functionality, and sleek design make this Cuisinart appealing for a lot of shoppers. Wide slots can handle bagels just fine, and that 3-year warranty Cuisinart offers is worth mentioning again. Available in 2- and 4-slot models and priced under $70 and $80 respectively, this is an upgrade from the compact toaster we discussed at the top of the page. This toaster doesn’t excel in even heating on both sides of the bread, and customers don’t like that it’s recommended to unplug after each use. Additionally, having a digital interface means there’s more to go wrong — and once the screen is out, it’s worthless. The price point is a little odd in that it’s not a high-end, over $100 toaster, but it’s considerably more than a lot of other toasters. Still, fans love this toaster and sing its praises, so it’s probably worth your time if it’s in budget. If there were a beauty queen of kitchen appliances, KitchenAid would be the one to beat. Fans are drawn to KitchenAid products because the brand does an amazing job of coordinating products and helping cooks match their favorite colors. Having said that, a lot of KitchenAid products get a bad rap because, well, they’re not always great (the signature stand mixer being the key exception). Personally, I am hesitant to recommend a KitchenAid toaster because I’ve had trouble with mine from the get-go (mine is similar to this model, not this two slot I’m discussing here). 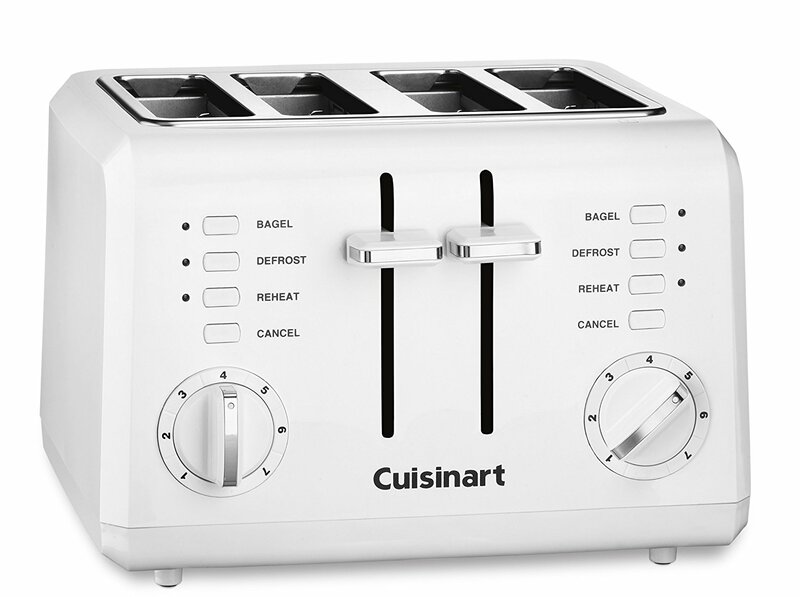 But, through our toaster research I came across this 2-slot model and have found that, overall, it’s a pretty good toaster. Average reviews across various sites are around 4 stars, with anywhere from 85-91% of buyers saying they’d recommend. So, we think this is worthy of this list because, after all, it is a lovely KitchenAid that will look fabulous on a lot of folks’ counters. Oh, and it seems to toast well, too. We have a few options for you if you’re willing to splurge, and all of them come from Breville. 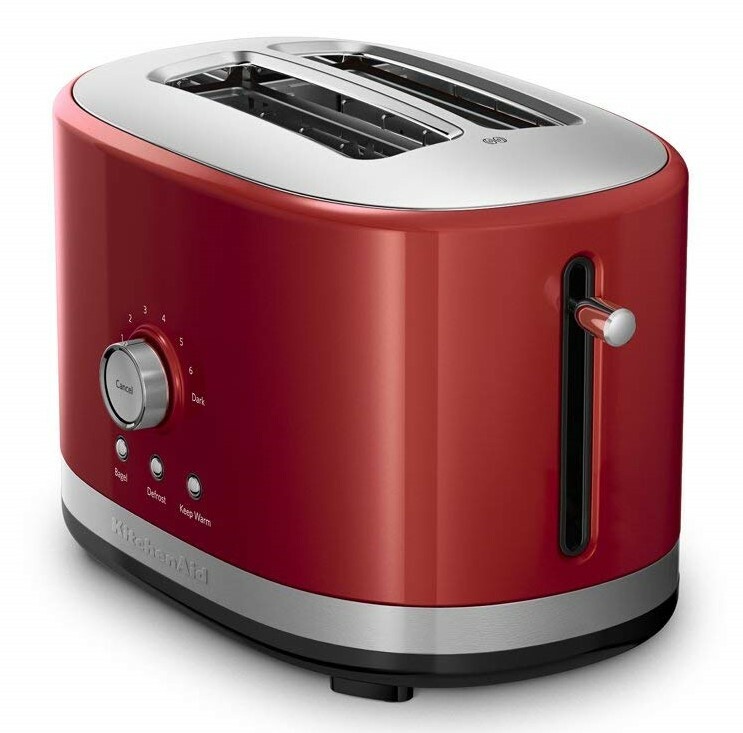 (There’s also one more splurge toaster that we’ll talk about below in the ‘Best Looking’ category!) Here they are, arranged by price. 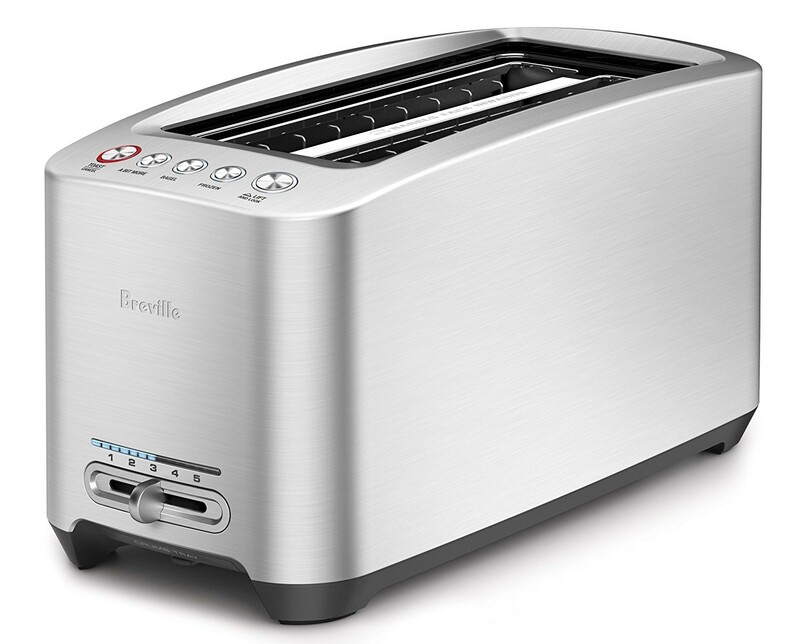 Breville makes some outstanding products, and there’s a lot to love about this ‘Smart’ toaster. Sure, it’ll run you about $130, but if you eat a lot of toasted things and want a high-end, durable toaster, this is worth your attention. The Smart Toaster features a leverless design: Just push the button to lower the bread. Additional settings like “Lift and Look” and “A Bit More” are responsive and let you get your toasted goods just right. The two listed here are virtually identical (and essentially the same as the 2-slot), with the slot style being the main difference. 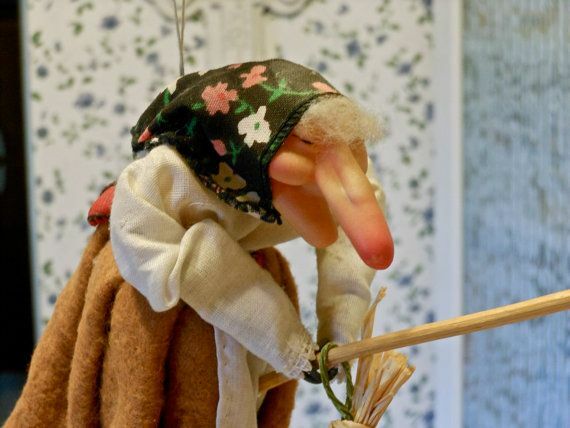 The Long Slot (pictured) accomodates longer artisan bread or four slices of regular bread. These also include the Bagel function (which toasts only the inside to prevent the outside from burning), “Lift and Look,” and “A Bit More.” Both options retail about the same, but as of today the long slot model is actually a bit cheaper at under $170. Due to the “smart” features of this lineup of Breville toasters, you can expect to see bad reviews due to malfunction. That’s typical with digitized appliances, and many of these sorts of features are fairly new. 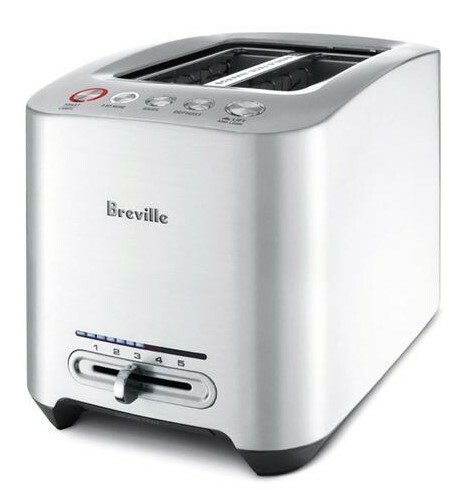 However, overall all three of these Brevilles are really outstanding (provided you get a good unit, of course!) and are definitely worth the splurge. A key downside to keep in mind is the limited warranty; at just one year, you’re out of luck if it malfunctions after 366 days. If a longer warranty is important to you, Cuisinart is about your only option. I will fully admit that I’m a bit obsessed with Smeg’s aesthetic, so I was pleased to discover that the Smeg toaster is actually rated fairly high! Customers and testers alike find that this toaster performs well in addition to looking retro-fabulous. 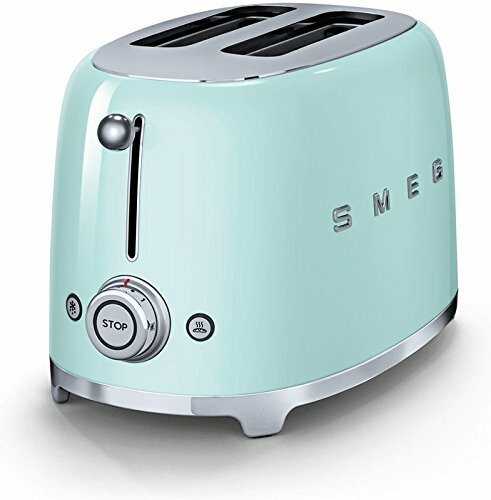 Available in colors like black, mint green (pictured), pink, red, and more, Smeg offers a refreshing option for buyers seeking out toasters that also function as decor. You will pay a pretty penny for this toaster, but that is primarily for the name, design, and innards. It doesn’t have any fancy interface situation happening, and it’s a standard knob, lever, toast-or-bust kinda appliance. There are negative reviews that indicate there are some lemons, but overall Smeg offers quality products that typically work well and last long — while looking great, too.